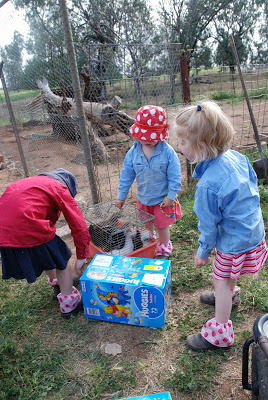 With the farewell of the pigs came the introduction of some new poultry for our Chook Yard. Our sole remaining Hen Mrs Wishy Washy and our sole Rooster Bucko were looking a little lonely so we found them some friends. 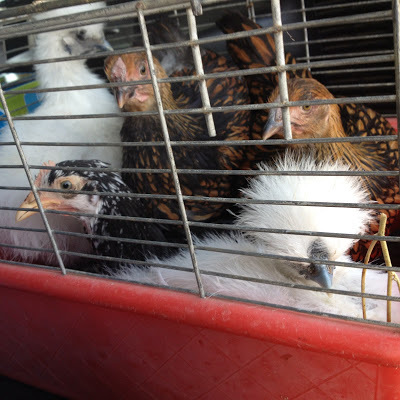 7 new hens of various breeds to brighten up the chook yard and help fill my egg holders in the fridge. It was definitely a family effort to move them into their new home, they were all patted and held to help get them familiar with us. My Muddy Puzzler needs a few more lessons on holding as her hold is more of a strangle. 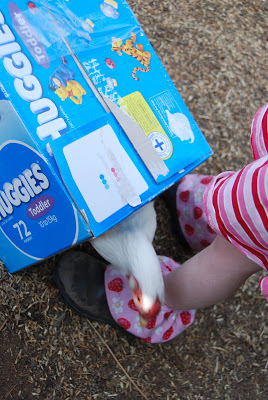 The new chooks were keen on the Sock Protectors mistaking the strawberry pattern for real strawberries and having a peck. 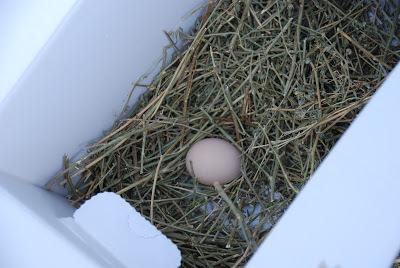 And a nice surprise when we took one out of it’s box – a egg freshly laid! 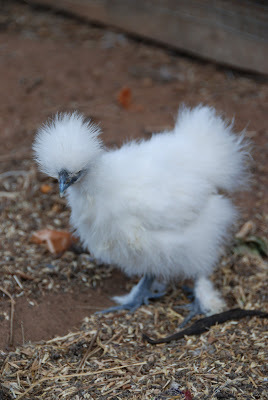 For those that are interested we now have 2 Silkies, 2 Gold Laced Wyandottes, 2 Rhode Island Whites, 1 Ancona, 1 Isa Brown and 1 Astralorp Rooster. 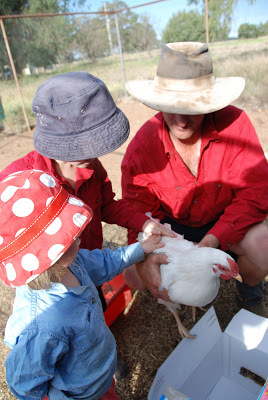 They are a hit with the Muddy Kids, they check the eggs several times a day, help spread fresh hay in the roost and feed them at night, all a nice start to doing chores and helping out, a win for everyone really. 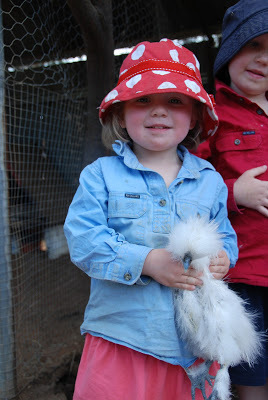 This entry was posted in Family, Farm, Photos on September 18, 2012 by nat. A good egg? Looks good! 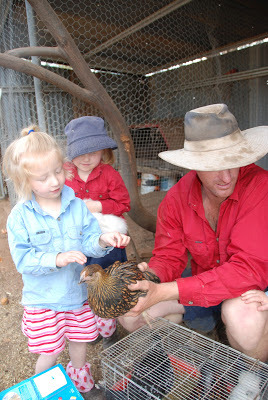 I used to keep bantams when I was a kid..Twinkle, Speckles and Ginger, they’re great for kids, very handle-able. Your posts make me itch for a getaway. Or a sea change perhaps? 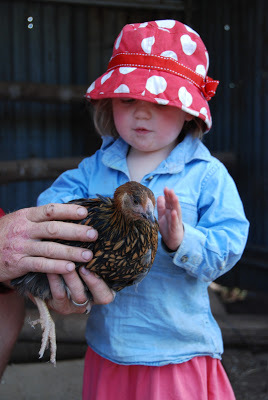 My hubby keeps threatening to put some chooks in our back yard…doesn’t look so bad after this!! Especially if the wombles will do all the work! Awww, the kids must love it. 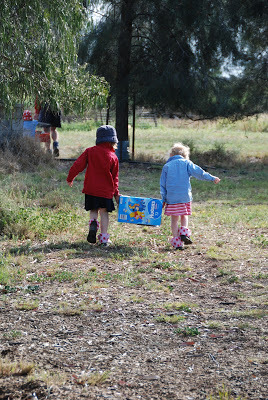 I agree with Mum on the Run, makes me want to get away to the country with the kids – they miss out on some fabulous experiences living in the “burbs”. That’s awesome. 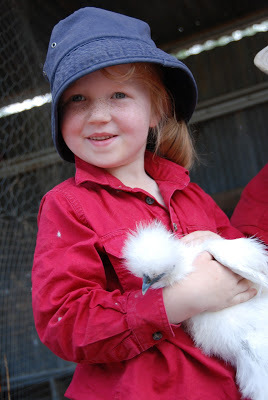 I’ve always wanted chooks! But what with a rather tiny yard, and an assortment of animals already (dog, cat, rats) I think it would make my small suburban home a little too zoo-like!